The Lowdown aims to make evidence-based journalism and research on the NHS available to all campaigners and union activists, with a searchable website and a pdf round-up to supporters, beginning fortnightly and building to weekly to keep pace with fast-moving stories. It will critique mainstream and specialist media news and break new stories. 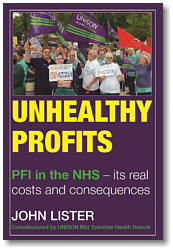 Unhealthy Profits is written by John Lister and commissioned and published by UNISON Mid Yorkshire Health Branch. It covers the origins, theory and practice and the costs and consequences of the Private Finance Initiative in Britain's NHS, as well as the case study of the ongoing 25-year fight against it in Mid Yorkshire, and a chapter discussing what to do about it. An extended Postscript looks at the spread of PFI and similar Public Private Partnerships around the world, creating similar problems for governments and health care staff and management. The book is available as a Kindle Edition (£7.50) or as a paperback (£9.99) from Amazon, with bulk orders (including colour photos) directly from the branch: midyorksunison@aol.co.uk. 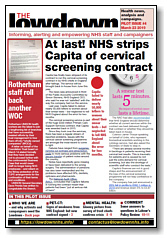 ﻿from Samantha Wathen, Press and Media Officer for Keep Our NHS Public. 2012-13 saw the first reports of a winter crisis, but the situation has deteriorated dramatically since then as funding has not kept pace with the added demands placed on the service, while a collapsed social care system leans on the NHS very heavily.